The wheel. The printing press. The telephone. The automobile. Aviation. Radio and television. The internet. These are among the transformative inventions that improved the quality of people’s lives and changed the course of human history. If you ask me, karaoke belongs on that list. But where did it come from? Fewer people are versed in the history of karaoke in the United States. Inoue’s invention reached critical mass in the U.S. in the 1990s, but its American presence dates back somewhat earlier than that. Appropriately enough, karaoke made its American debut near Hollywood, the global epicenter of the entertainment industry. 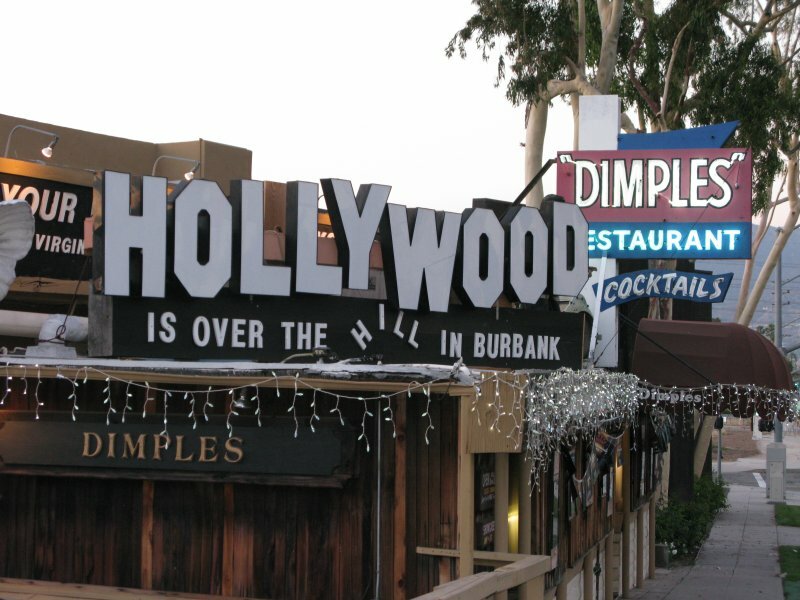 The first venue not only in the United States, but in all of the Western hemisphere, to offer the chance to sing with pre-recorded instrumental accompaniment was the Dimples Supper Club (also known as Dimples Showcase) in Burbank, California. Named for a Shirley Temple movie, Dimples opened its doors in 1982, and its customers have been singing their hearts out ever since. For anyone serious about conducting a World Karaoke Tour, Dimples is a required destination. 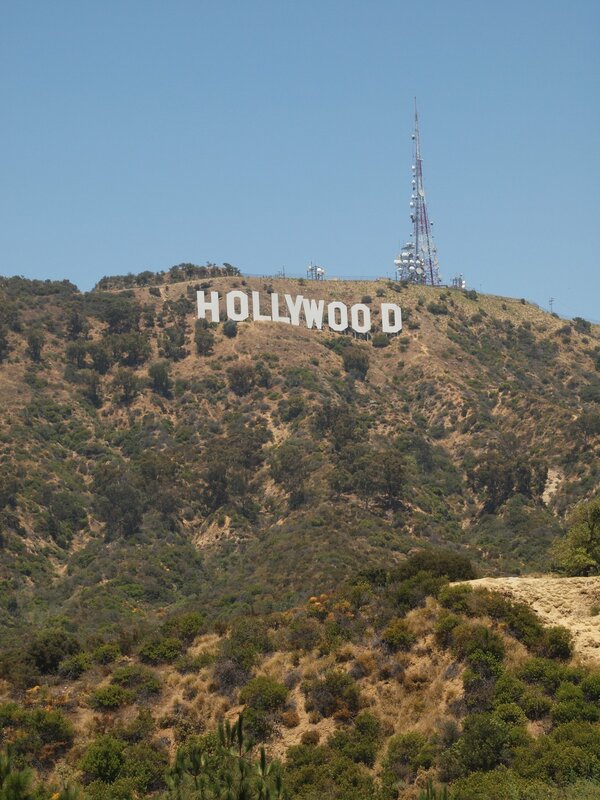 If you want to explore La-La Land in all its glory, a visit to Dimples is just as integral to the Hollywood experience as the Universal Studios tour or Grauman’s Chinese Theatre. 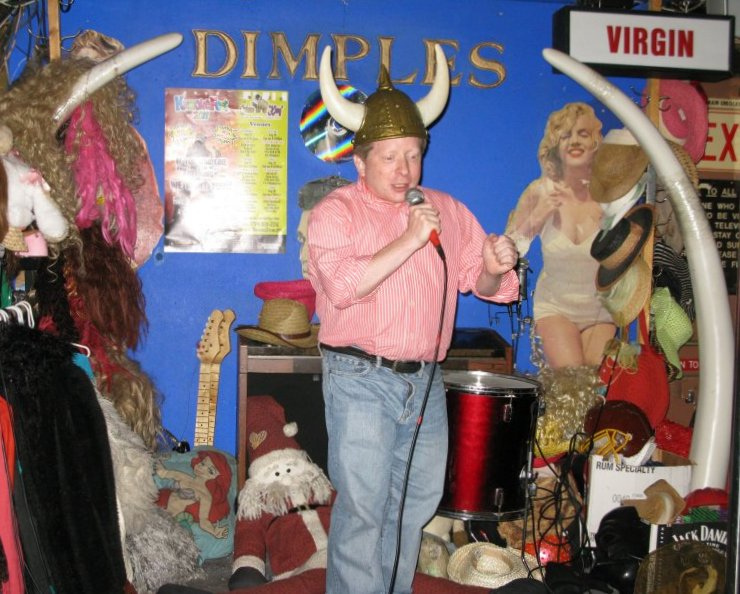 Haskins, who reportedly has been a regular at Dimples since 2002, has actually released a CD compilation of his karaoke stylings (you can also download the tracks individually as MP3s). But I digress. I’ve been to Dimples twice so far: in November 2009, and July 2011. The decor of Dimples can best be described as . . . garish. The stage area is festooned with props, and singers are regularly encouraged to don bizarre hats and other unusual headgear. For example, the last time that I took to that stage, proprietor Sal Ferraro insisted that I wear a Viking helmet. Because apparently, nothing says “karaoke” like a pair of Viking horns protruding from your head. Naturally, I obliged. One of the coolest features that Dimples boasts is its live video feed. If you’re singing on the Dimples stage at any time between 6:00 pm and 2:00 am, Pacific time, people all over the world can go online and watch your performance in real time! (another notable karaoke bar with a live webcam broadcasting from its stage is the Cats Meow in New Orleans. As you might expect, I’ve been to that legendary Big Easy karaoke joint too). In addition, after your song is finished, the Dimples management presents you with a free DVD and Polaroid photograph of your performance. Typically, the person bringing these mementoes to your table is Sal himself, who often goes by the moniker “Mr. Dimples” (Sal is an interesting man in many respects, who has visited over 100 countries, thereby qualifying him for membership in the prestigious Travelers’ Century Club. However, the Dimples website, while supplying this tidbit, does not indicate in how many of those countries he’s sung karaoke). Admittedly, the need for such recordings to be supplied by the establishment is greatly diminished in an age where everyone has a smartphone that shoots HD video. But it’s still a nice touch. Plus, the DVD is of superior quality to anything your inebriated friends are likely to produce. Update (April 2013): My 2011 visit to Dimples was not particularly enjoyable. On that Saturday night, Ferraro, who was acting as karaoke host, was enforcing a policy that, once you’d sung your first song, you would not be called up to the stage again until everyone else who wished to sing had gotten at least one song in (regardless of whether they’d entered the building five minutes ago or five hours ago). As a result, I was made to wait two and a half hours between songs; the constant influx of newly arriving patrons resulted in my being pushed further and further back in the queue. (Most professional karaoke hosts work new singers into the rotation in a staggered manner.) The unacceptably long wait to sing my second song of the evening was upsetting to me, and led me to avoid Dimples during a subsequent visit to Los Angeles in 2012. In recent years, it wasn’t just me who’d been turned off by Dimples. The bar was perceived as being in a state of decline. But it’s recently undergone an extensive makeover that was overseen by the reality television series, “Bar Rescue”. You can read about that overhaul here. The changes that have been made — including a revamping of the bar’s interior and the promotion of a staff member to replace the octogenarian Ferraro as karaoke host — should reinvigorate Dimples. Although I’d previously felt that I didn’t need to go back to Dimples again, I’m now inclined to give it another chance during my next visit to the area in September 2013. It’s also good to know that a venue with such an illustrious history now has a bright future. If you enjoy karaoke and your travels bring you anywhere near Los Angeles, you should give strong consideration to spending an evening at Dimples. At the very least, you’ll be able to say that you sang at the place that introduced Daisuke Inoue’s invention to North America. Note that if you go, the renovated interior will look considerably different, and much less garish, than in the photo and videos above.